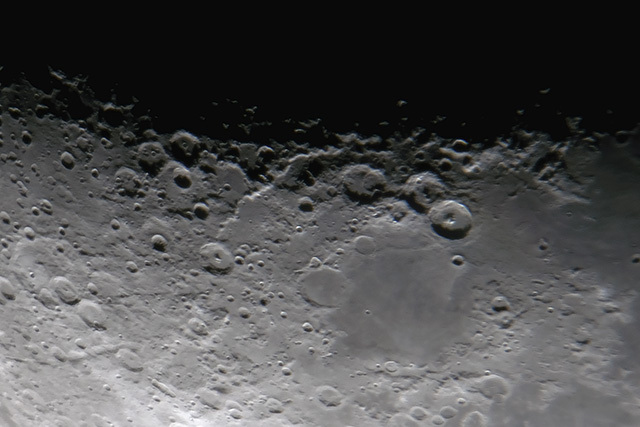 The Moon's Mare Nectaris with (left to right) Janssen (center left), Rupes Altai (arcing from the left to above Nectaris), and craters Catharina, Cyrillus, and Theophilus (above Nectaris). I decided to do some video stacking tests of the Moon tonight and took the opportunity to take some close up stills as well. This image is from the stills. Questar 3.5" telescope with 2x2x Dakin Barlow lenses and a Sony a6300 camera for a total of about 5000mm of focal length. Images exposed at ISO 800 for 1/15 sec. Best 8 stacked and deconvolved in Lynkeos with final crop and exposure adjustments in Photoshop.